Tampa Bay and the LA Kings discussing a trade? 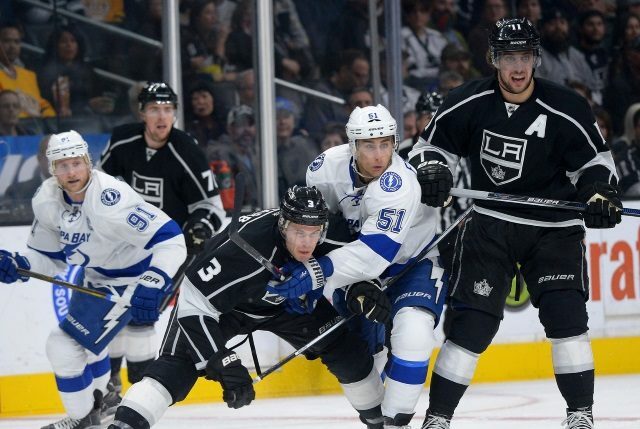 The Fourth Period: It appears the Tampa Bay Lightning and Los Angeles Kings may be engaged in trade discussions, as the two clubs have been following each other around lately. It’s unclear whom the Lightning and Kings are discussing, or if they’re involved in heated trade talks, but Los Angeles is believed to be open to taking calls on just about every one of its players, including defencemen Alec Martinez, Derek Forbort and Jake Muzzin. With limited salary cap space, any trade the Bolts complete with the Kings is likely to involve players with similar salaries. TSN: Bob McKenzie reports the No. 1 priority for the Philadelphia Flyers is getting back in the playoff race and to make the playoffs this year. A lot of people think Ron Hextall was fired and Chuck Fletcher was hired ostensibly because the ‘win now’ mentality is back in Philadelphia. McKenzie states, don’t expect Chuck Fletcher to come in and start trading first-round picks or a prospect like Morgan Frost for immediate short-term help to try and get himself in the playoffs. I think there are two things on the to-do list for Fletcher. No. 1 is maybe finding a short-term fix in net. The goaltending hasn’t been good enough. And it could be a short-term but might even be a longer-term fix, but that is something they absolutely have to look at. The other one would be giving Dave Hakstol, the head coach, a fair amount of time for evaluation.